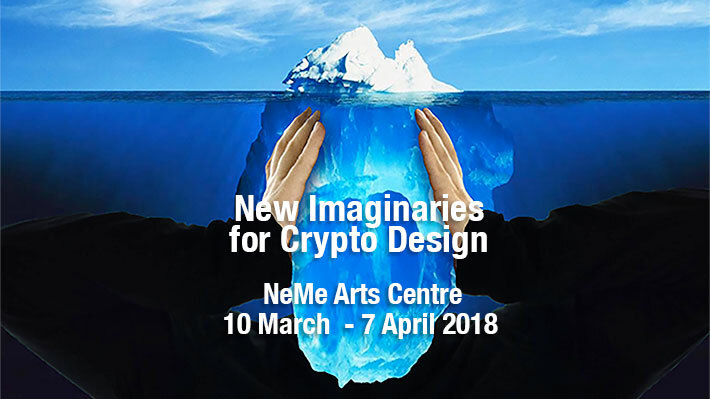 On Saturday, 10 March 2018, at 7.00pm the Institute of Network Cultures and NeMe invite you to a talk by Patricia de Vries and the opening of the exhibition New Imaginaries for Crypto Design. The Deep Web evokes images of an underworld, the locus of shadow economies where illicit trade takes place that cannot bear the light of day. This image is understandable if you consider the bad press encrypted channels have received over the years. News reporting mostly publishes sensational stories on cyber-criminals operating in a virtual legal vacuum on the Darknet, arms and human trafficking, murder-for-hire and extreme gore on contraband websites such as Silk Road. Data leaks, such as the Panama Papers, further politicised this so-called “invisible” web. Furthermore, the popular Deep Web documentary (2015) helped shape a dramatic image of these impenetrable parts of the Internet as a lawless cove, mainly populated by bandits, predators, and pirates. The Internet is often thought of in terms of naval metaphors. It can be thought of as a sea that can be surfed and navigated by search engines. Of course, metaphors are often meant to grasp something unfamiliar by comparing it to something familiar. One of the more dominant metaphors of the Deep Web is the iceberg. The top of the iceberg, above the surface of the water, represents the Surface Web. The Surface Web contains all the data that can be “explored” by search engines like Google, Yahoo, Opera or Bing. Diving below the surface leads you into the nether regions of the Deep Web, with a vast amount of data that cannot be indexed by any of the popular search engines. In this iceberg metaphor, the part of the iceberg which is ‘below the water,’ shapes popular understanding of the Deep Web. As we all know, visual language, symbols and metaphors help us to describe, classify, and understand the world around us; they are crutches for our mind. Images are often more powerful and influential than the things they represent, think of the cloud or the envelope and trash can icon in your (web) mail. Images are crucial vehicles of meaning making and production. In turn, the image of the iceberg gives shape to the Surface Web, and affects how the Deep Web comes to mind. For many, the Deep Web seems inaccessible to ordinary internet users – a members-only club of tech savvy geeks, hackers and fishy figures. Have you ever sent an email through webmail? Have you ever paid your share of a dinner bill to a friend via online banking? Watched a movie on Netflix? Read an article on a password-protected website? Unwittingly, many of us use the Deep Web on a regular basis. How can we begin to understand the structures that facilitate all of these every-day actions? What visual interpretations shine a light on the deep waters to reveal a more nuanced picture than that of the iceberg? This exhibition dives into these lesser-known parts of the web in order to resurface with a trove of imaginaries and metaphors. Let’s decrypt the ‘deep’, enter its seemingly panic-room locked doors, explore its corridors, let light pour in and stale air escape. This exhibition is a result of an open call to artists, designers, researchers and visionaries who are creating new images of the Deep Web. Patricia de Vries is project coordinator at the Institute of Network Cultures, and is responsible for coordinating current research projects. Patricia has an academic background in Media Studies (BA), Cultural Analysis (MA) and Liberal Studies (MA). Over the years, working with several media, cultural and research institutions in different capacities, she gained a wide range of work experience in research, editing, and project and event management. Among other things, she worked as a film programmer at Studio K, as an editor of the art magazine Simulacrum, and as a marketing and PR assistant at Boom Publishing House. From 2010 until 2012 she was based in New York where she served as a research and communications associate at the think tank World Policy Institute, and as a teaching assistant of prof. James Miller at The New School for Social Research. Jonas Althaus, Jeanine van Berkel, Anna Bleakley, Camilo Cezar, Félicien Goguey, Arantxa Gonlag, Juhee Hahm, Abdelrahman Hassan, Kimberley ter Heerdt, Jake Henderson, Julia Janssen, Nikki Loef, Melani de Luca, Gianluca Monaco, Julia la Porte, Roos du Pree, Renée Ridgway, Yinan Song, Carlo ter Woord, Amy Wu. Venue: NeMe Arts Centre, Corner of Ellados and Enoseos streets, 3041 Limassol, Cyprus.